Price:$25 half hour, $50 an hour. $10 extra for travel. Styles Taught:Electric guitar, Acoustic, Nylon, Bass. Contemporary, blues, rock, jazz, Fusion, Latin, World music, pop, funk, R&B and soul. 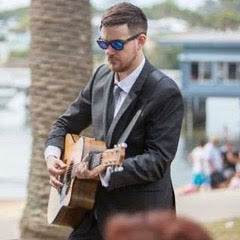 David teaches in Drummoyne and the Inner west of Sydney and can help you attain what you want to achieve in guitar playing and also help you in areas that you are having problems with, and need correction. He is also a high school music teacher. David can teach you songs that you would like to learn and other guitar skills and theory. We can learn the finer points of guitar playing such as chord progression, scales/modes, music theory, improvisation, guitar techniques, song writing. David an experienced musician and have played in numerous bands and performances. David have been playing for 10 years and have experience with many types of genres such as rock, blues, Jazz, Fusion, Latin, country, metal, classical, acoustic, soul and much more and can help you attain different styles of playing through these genres. He has also graduated with a Bachelor’s of music from the Australian institute of music. The lessons with David are very good. Im learning alot!